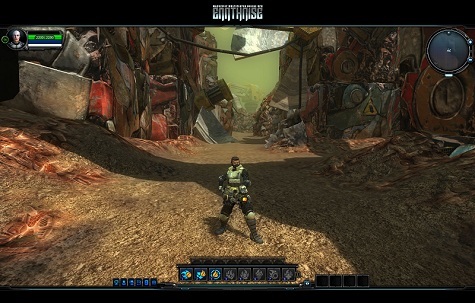 Earthrise was a sandbox MMORPG that some of you might vaguely recall from many, many years ago. It launched in 2011 under Masthead Studios and could best be described as an unmitigated disaster from the get go. The game just wasn’t good, it offered manual aiming but neither the server or client performance to pull it off. Gameplay consisted of a laborious grind, the game seemingly punishing you for deciding to buy into it by tying its combat to one of the most dull systems in the genre while also forcing you to grind thousands of creatures to build your gear to grind thousands of creatures to build better gear. Needless to say, the game died fast and one year later in 2012 Masthead Studios handed over control of the title to Silent Future who have been, well, mostly silent about the future of this game. When we last talked about Earthrise, the MMO was gearing up for its closed alpha testing for a reboot under developer Silent Future. That news was over six years ago. Since then, the servers and website have gone up and down but the title has seemingly been abandoned in recent years. The last update on the game’s Twitter and Facebook pages was from 2016, but the website itself has been dead for a couple of years now and the servers themselves have been offline for an indeterminate amount of time. Interestingly, I happened to get a response from the official Facebook account for Silent Future confirming that the game has not been cancelled. As far as the game being actively developed, that is up in the air. I’m interested to see what Silent Future is going to do with Earthrise, since after seven years you might as well have just used the assets to try and build a new game. Earthrise was dated and functionally a dead end even back in 2011 when it launched, I can’t imagine the MMO gamer base flocking back to the game that they universally rejected after such a long absence.